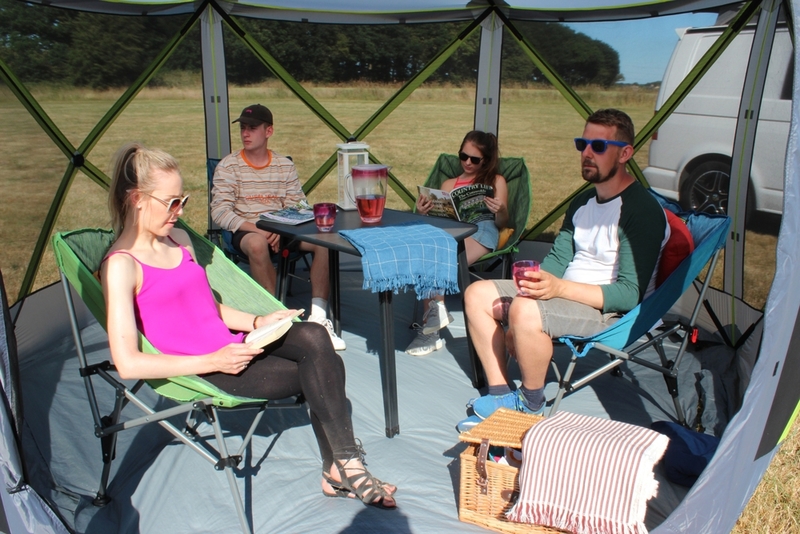 Introducing the lightweight Cayman Screenhouse freestanding gazebo, pitched quite literally in seconds as a result of our BRAND NEW innovative fibreglass pop up system; this gazebo provides simply the most FLEXIBLE utility space to complement your camping, caravanning or motorhoming setup, specifically designed with cooking, relaxing, storage, pets, shelter, dining and affordability in mind! Are you looking for the Cayman Screenhouse 4 (2019)? Available in four or six sided variations; this enclosable standalone canopy is the PERFECT porch extension for those with vehicles, enabling the user to kick back and relax in sunny or breezy weather, protected against the elements from the luxury of within the utility tent, with thanks to the 3,000mm² hydrostatic head attributed by the premium 100HDE fabric weave. 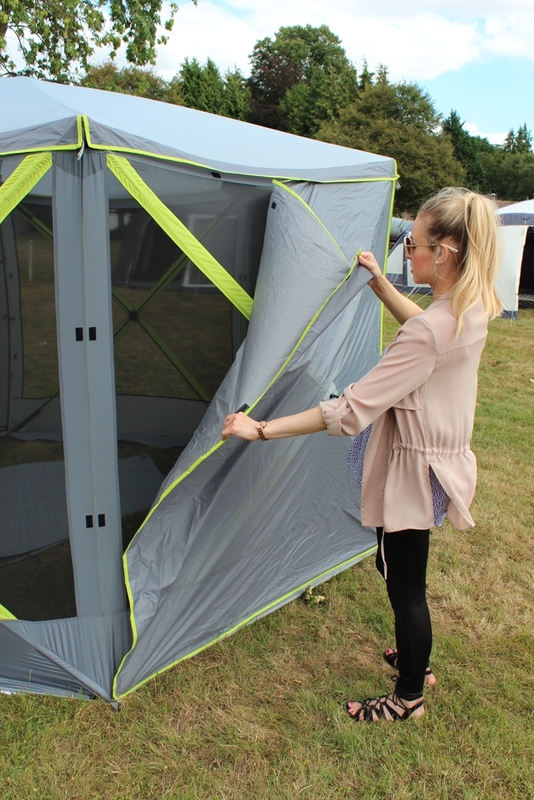 The front panel can be zipped completely open for optimal breathability in warmer temperatures or climates, whilst the mesh side panels enhance air circulation and keep insects at bay; these can be accompanied by optional toggle in 'Privacy Panels' to maximise privacy when winding down on an evening. The Cayman Screenhouse comes complete with a silver reflective coating to add a stylish and contemporary finish to our modernized design, PE mud wall flaps to trap heat within the gazebo and prevent chilly draughts, steel ground pegs, plus attachment points four our exclusive 'Lumi-Link' or 'Up/Downlighter' lighting systems, should you wish to create a cosy evening ambience. 100HDE Fabric - An Ultra-Lightweight Material with a Contemporary Print, Designed to Pack Neatly Away Into Its Inclusive Carry Bag. 3,000mm² Hydrostatic Head & Fully Taped Seams Throughout - Exceptionally Waterproof; Water Will Simply Bead Onto the Surface and Roll Off. Fibreglass Pop Up System - Innovative Pop Up Design to Ensure Effortless & Rapid Pitching. Mesh Side Panels - Strategically Positioned Mesh Side Panels to Optimise Air Circulation & Keep Out Insects. Roof Exterior Silver Reflective Coating - Adding a Stylish, High Visibility & Contemporary Aesthetic. Polyester Mud Wall Flaps - Aiding in Trapping Heat Inside the Gazebo During Cooler Months, Preventing Those Chilly Draughts. Zip-Open Front Panel - Zips Fully Out for Additional Breathability in Summer Months. Lumi-Link & Up/Downlighter Attachment Points - Enabling the Option of Creating a Cosy Evening Ambience.